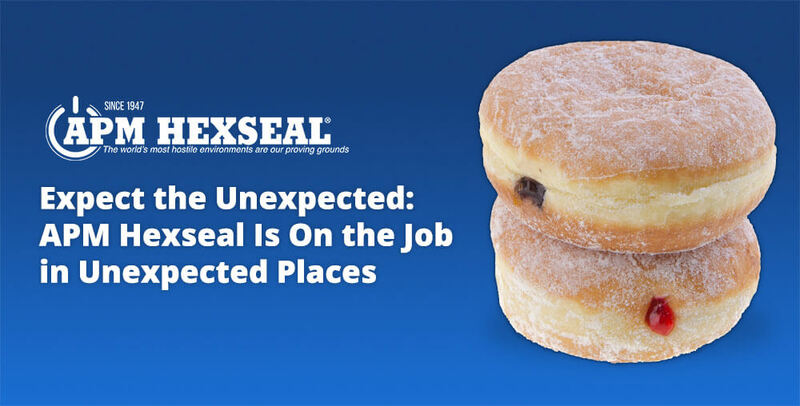 Expect the Unexpected: APM Hexseal Is On the Job in Unexpected Places » HHP Associates, Inc.
You can find APM Hexseal products all over the world, playing indispensable roles in the manufacture of products ranging from doughnuts to drones. APM Hexseal’s products benefit doughnut makers by keeping the tools used to inject jelly or cream into the center of the dough free of contamination. Self-sealing boots and fasteners allow these machines to handle sticky or viscous material without it clumping or leaking, resulting in the efficient creation of delicious products around the clock. The FDA mandates that all commercial dairy farms use mechanical milking machines to improve sanitary conditions in barns. Many dairy milking machines take advantage of our range of self-sealing boots and fasteners to keep milk flowing from cows to storage tanks while preventing leakage or outside contamination. Many boats use APM Hexseal’s long-lasting, corrosion-resistant, and waterproof self-sealing boots and hardware to prevent moisture, salt and dust contamination to sensitive onboard equipment. Their sealing solutions allow you to easily use navigational and other electronic equipment come hell or high water. APM Hexseal creates sleek, low-profile seals and fasteners that help high-end vehicles maintain their performance without hurting their appearance. Using APM Hexseal’s products, luxury vehicle manufacturers can deliver cars with trusted performance and chic aesthetics. Drones experience a variety of environmental and pressure extremes. APM Hexseal products help prevent moisture and dirt contamination when drones are hundreds of feet in the air, and they naturally adapt to the changes in pressure and temperature that drones regularly experience. APM Hexseal’s equipment protects sensitive switches and components from climate extremes on commercial fishing fleets. Because APM’s sealants can adapt to pressure changes, they can withstand conditions on your ship’s deck as well as those hundreds of feet underwater. APM Hexseal sealants allow you to efficiently channel the flow of beer and other liquids into and out of kegs and taps. Because they’re comprised of silicone and rubber polymers, they resist corrosion that may result from the basic properties of beer and other alcohol. APM Hexseal’s sealing solutions keep instruments and sound equipment at optimal functioning capacity in indoor and outdoor venues. With APM Hexseal, your equipment will sound great no matter where you go, sealing against rain, dust, sand, and salt. Snow blowers use sensitive electronics in cold and wet conditions. APM Hexseal’s sealants help ensure that you will always be able to dig yourself out after a winter storm, as they prevent damage from occurring to the parts of the machines that shouldn’t contact snow, ice, sleet or salt! Emergency vehicles demand optimal performance across all kinds of extreme conditions, meaning that they require components capable of withstanding intense work. APM Hexseal’s products seal against weather, chemicals, and dirt, so they function when you need them most.